17 Handheld Or Larger Units? 18 Are Specialized Sprayers Any Good? If you are looking for a paint sprayer that can handle a range of DIY projects you have come to the right place. This top 10 paint gun list will help you find the best paint sprayer for your projects. Not all paint sprayers are created in the same way and every unit features different mechanism that includes airless, handheld, suction feed, gravity feed paint spray guns and many more. When you are looking for your first paint sprayer, you will see that there are many different types of paint sprayers from many different manufactures available on the market. Therefore, with so many different types and price ranges to choose from, it can become a daunting task to find a unit that fits your project and experience. For that reason, it goes without saying that if you are looking for ways to save time on your next DIY project, then you must invest in a paint sprayer that allows you to finish the job quickly and efficiently. However, picking a great paint gun is actually a challenging process because there are many things that you must have in mind before you make up your buying decision, so taking the time to read paint sprayer reviews should help with the process. Preferably, the perfect sprayer should be affordable, reliable, versatile and most of all, fit your spray painting needs. Overall, some units out there are manufactured with specific features that include various paint feeding mechanism and pressure levels. MOreover, some units are even built to spray varnish, lacquers or stains. Read the paint sprayer reviews below and check my picks of the best rated paint sprayers on the market today. The average length of the power cord is offset by the great spray gun distance of a max 30cm. With 400 watts of power, there are plenty of jobs that will go smoothly by using the C800766. The most special feature of mighty Wanger 0518050 is that, it can spray up to 4.9 oz. per minute, making it a powerhouse in the low price class. The wand lets you control the pressure fully, making it child’s play to vary the amount of paint you disperse at any given time. Setup requires a little more know how than a regular paint sprayer which is why Astro included detailed instructions. This comes in handy when you consider its other major feature, the ability to use paint directly from a one or five gallon bucket. Starting off the list is the most convenient to use Tacklife SGP15AC, a spray gun that is as good in performance as it is in price. It comes with three spray patterns and nozzles sizes, so out of the box is suited for all workloads. Flow rate is adjusted with the easy to reach valve knobs. You can do this on the fly while painting or during a break. Distance is good with this low priced spray gun, and the 5.9 ft. power line is suitable enough for small and medium rooms. Anything bigger will require an extension cord so that you can work comfortably. The average length of the power cord is offset by the great spray gun distance of a max 30cm. 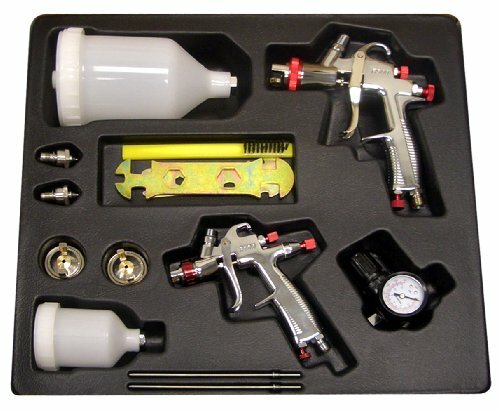 For hand spray guns, this puts it firmly in the top class for its current price range. To make things easier for the consumer, all parts are removable. Cleaning and maintenance is a snap because of this, leaving less parts open to long term damage. Also inside the package is a funnel, cleaning needle, two gaskets, a cleaning brush and a two year warranty. This is a great paint sprayer for novices and experienced users that want a good value. This is for beginners and intermediate users. Beginners will love the simplicity of the features, along with all of the extras that they’ll ever need. Intermediate users will appreciate the value, with the SGP15AC doing just enough to get them through light and medium projects. It is a great starter painter sprayer with very few cons. The C800766 is another low cost paint sprayer that capitalizes on portability with low power draw. Ease of use is the main draw, although the price may be a priority for some consumers. This fully contained unit doesn’t use a compressor to maximize its power. With 400 watts of power, there are plenty of jobs that will go smoothly by using the C800766. Instead of big droplets and wasted paint you get a concentrated spray that provides one of the best finishes of any paint sprayer on the list. Users get more control with the brass spray tip to prevent unsightly paint jobs that look like they were done by amateur paint rollers. Marketed as a high volume low pressure sprayer, consumers will find the 27 ounces of paint it holds to be just enough for small jobs. Three different spray patterns can be used for each project using on the fly controls. Included in the package is an air nozzle, cleaning brush and viscosity cup. At 2.76 pounds of weight, it is close to the lowest in the category. 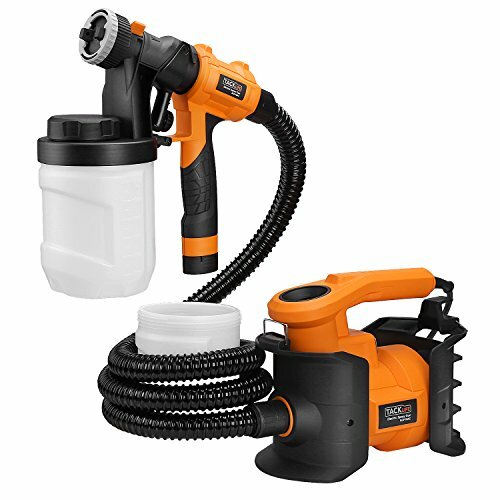 Buyers that need a sprayer with high control will be satisfied with this purchase, you can see our guide on HomeRight paint sprayers here. Beginners and intermediate users will get the most out of this product. Balance is something that you can’t take for granted when painting, and that is exactly why the C800766 comes recommended. You can avoid making costly mistakes and not burn through a lot of expensive paint. Handles a large variety of paint and isn’t too picky about the brand. Compatibility won’t be an issue with this model. Another low priced paint sprayer that earns its way onto the list comes from Wagner. They’re a popular brand that continues to make great paint sprayers with cutting edge features. The most special feature of mighty Wanger 0518050 is that, it can spray up to 4.9 oz. per minute, making it a powerhouse in the low price class. Handling finishes with this model isn’t a problem, with the two stage air turbine handling multiple spray types. Spray pattern adjustments are vertical/horizontal fan and round. You can change it on the fly by adjusting the air cap to the desired pattern. Outside of regular paint, you can use thin materials without damaging the product. Sealers, varnishes, lacquers, urethanes and even stains are all compatible with this model. Half a quart in storage for your materials should be enough to finish small and medium size jobs. Anything bigger would have messed with the weight of the product, which is about average. Setting up and cleaning this model only takes a few minutes, with the manual going into great detail about the process. Compatibility is the main reason buyers choose this model, which ranks high on Wagner’s paint sprayer list. The spray patterns and lack of paint storage makes this useful for beginners and some intermediate users. It was a nice touch to include a smaller material cup, which works well when you don’t want to waste time swapping out the original paint. Projects in larger areas won’t see any benefits from using this model. Air cap allows easy adjustments for spray types. Wagner made the actual click noticeable, meaning you don’t have to look down to see what mode it’s on. 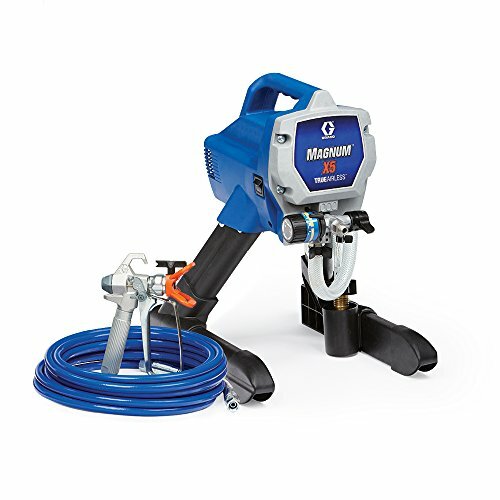 The Graco Magnum is the first mid-priced paint sprayer on the list, and is a huge step up from the low priced paint sprayers. For variety of painting tools under favorable price click here. Instead of being a small handheld sprayer that is an all in one piece, users now get a full core unit with a handheld wand. In some ways it is better than a handheld paint sprayer, with the long hose and power cord giving you plenty of room to operate. The wand lets you control the pressure fully, making it child’s play to vary the amount of paint you disperse at any given time. Projects that need a lot of precision will benefit from the wand’s accuracy. Cleaning is handled with the PowerFlush adapter. By attaching it to your garden hose, the entire unit is cleaned, a great low maintenance option. Clogs are fixed instantly with the RAC IV SwitchTip to help you deal with troublesome paints. But the greatest feature of all is the flexible suction tube. With it, you can spray directly from a paint bucket that is one or five gallons. A strong motor, great features and decent price turns this into an incredible value. Users of all levels will benefit from using this paint sprayer. There are loads of convenience features packed in at what is considered a fair price. With a good warranty attached, this is a tool that will last you for years. The award for minimalism goes to the Astro 4008, a low priced paint sprayer that gives users the bare essentials. Cleaning the unit is a snap since it is only two main pieces, the sprayer and cup. You’ll get a one quart max capacity cup to put paint in, which is sufficient for small rooms and detailing h tasks. Since this is built for attaching to air compressors, the design is light for single hand use. Pattern control is simple, although a default and wide pattern are the only modes supported. Both do a good job without clogging up like other paint sprayers, although this will have more to do with the attached air compressor. Setup requires a little more know how than a regular paint sprayer which is why Astro included detailed instructions. They’ll get you through the setup process and answer a lot of important questions about operating a unit that is air compressor supported. An air compressor with at least 3 horsepower and an available ¼ inch thread is needed for full operation. 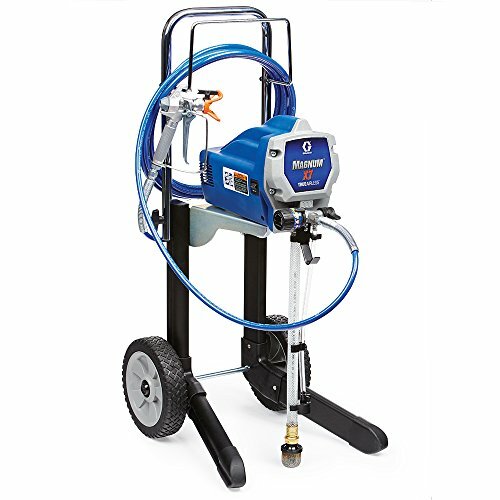 Buyers that already have a high grade air compressor can buy this paint sprayer for a full experience. Despite the minimalist look and features, this isn’t something that beginners will latch onto quickly. Intermediate and professional users will have no trouble with it, since they are more likely to want something heavy duty and flexible. Beginners can get better value from a paint sprayer that doesn’t require an air compressor. This is another version of the Graco Magnum, which is efficient and capable painting sprayer for different projects. It has a lot of features similar to others in its category, and comes at a mid-price point. It is close to being in the high price range, so those extra features do come at a certain cost. Pressure is controlled with the hair trigger on the wand, giving user’s great on the fly controls. When using paint that is unthinned, the motor is powerful enough to handle it at the highest pressure. This comes in handy when you consider its other major feature, the ability to use paint directly from a one or five gallon bucket. The suction tube that pulls the paint from the bucket is flexible enough to give you plenty of space to maneuver. And for those larger projects that need more hose slack, the unit comes with support for 75 ft. of hose. If you get a bargain on the hose, then it is a perfect long-term unit for all jobs. The popular Graco Magnum series strikes again and continues to be a great deal among paint sprayers. 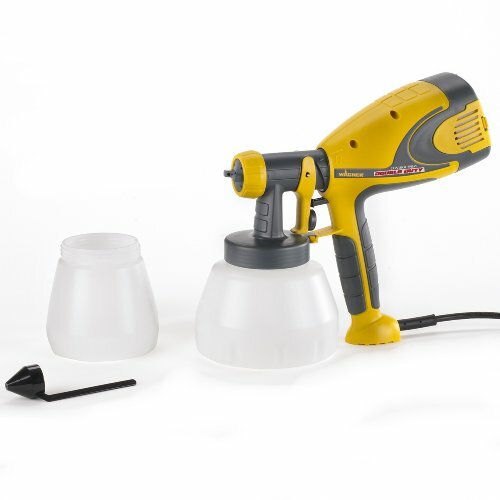 Buyers that don’t want to deal with the pain of refilling and cleaning paint cups will benefit from the Magnum series. The ease of use makes it suitable for all user levels, with an emphasis on medium and large projects. Smaller projects are supported, but in some cases would be overkill. The Siphon Gun is another compressor powered paint sprayer, but this time with an old-school twist. By using a mason jar, users can save lots of money by using any 16 ounce mason jar around the house. And since they come with their own lids, storying multiple types of paint for projects is trivial. It’s the best consumer based solution for managing and using paint with paint sprayers, at least for small to medium rooms. The price of the sprayer itself is low, so you won’t spend a lot upfront. An air compressor with a minimum of ¾ horsepower is required for operation, so lower end models will work fine. Included in the package is a single mason jar, the spay gun and pretty decent instructions. You can clean the product by attaching a mason jar full of thinners and spraying it out. There is support for paints, lacquers, thinners and stains. Depending on the brand, you can even handle thicker materials without worrying about clogs. At only 1.64 pounds, this is the lightest option on the list that requires an air compressor. Complex projects can do a lot with a little bit of imagination, and the help of this paint sprayer. Small and medium projects will be a cakewalk with the use of this product. All levels of users will find it is convenient to store the paint they want in multiple jars for later use. You have a long storage time, and switching out takes a couple of seconds. 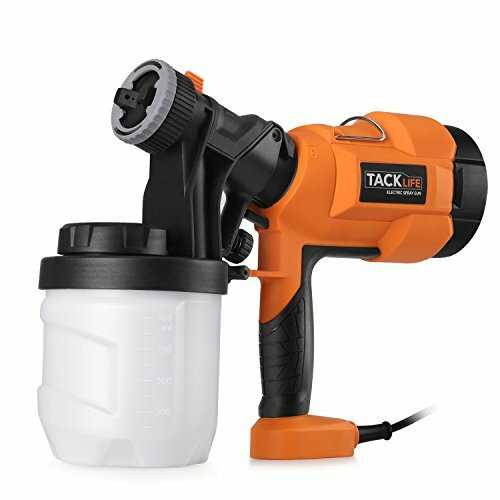 Despite the name, the Tacklife SGP16AC is a popular HVP paint sprayer that fits your painting requirements. It is a nice mix between a smaller electric paint sprayer and a paint sprayer that is powered by an air compressor. Using its own 6.5 amp 800w engine, users can use the included shoulder strap to carry it around and spray multiple objects. The spray flow is a powerful 1100ml a minute with a distance of 45cm. Three spray patterns can be switched to at any time, and they include circular, vertical and horizontal. Plenty of extras are included; two 1200ml containers, a funnel, cleaning needle, cleaning brush, spray tip key, two copper spray tips and three spray nozzles. With a little creativity you could put the base in a backpack so there is no strain on your shoulder while using. There are a couple of mesh backpacks that this will work with, but with a weight of only seven pounds you don’t really need it. Power cord length is above average, giving you plenty of room to maneuver since they kept the hose short. The Tacklife is a great choice for buyers that want the most power for the lowest price. The powerful motor is what makes this appropriate for all project sizes. It has professional grade mechanics but is geared more for consumer based painting. Professionals can use it, but may opt for more powerful options. Home based consumers get mechanics that are near air compressor quality but without the extra cost. The first high priced paint sprayer makes the list, and it is from the popular Magnum series. Several iterations of the series has made the list already, but this one stands out even among the best. A stainless steel piston pump does everything it can to power through unthinned paint. There are less clogs when dealing with thick materials, which means less downtime during a project. At high pressure it’s the most effective, pushing through without slowing down. In many ways it is similar to the other Magnum model listed before, with some slight changes to the design; it’s now a cart design that can be wheeled around rough surfaces and up stairs. Other improvements include support for up to 100 ft. of paint hose and a much more efficient motor. It can handle 125 gallons per year with no fuss, making this one of the more powerful in the lineup. Other key features have been tweaked like the RAC IV SwitchTip that reverses clogs, and of course the ability to use 1 and 5 gallon paint cans. Buyers can place their can wheel around their paint with the highly recommended Magnum 262805 X7. The X7 is a unique model in the Magnum series, and is useful for home and professional users. Beginners will have no trouble using it, and professionals will love the advanced features. Buyers just need to look at other products in the Magnum line so they can assure they are getting the greatest value. For a little bit more money you can go higher up in the Magnum series and get a more powerful unit. This of course comes with its own set of cons, but is still considered a valid option. This is the most expensive low priced model on the list. The Super Finish Max Extra has medium grade performance for a low price, something that is hard to find with paint sprayers. An all in one contained unit, it handles paint like a champ. You still need to thin some brands a bit, but you’ll find the mechanics are powerful enough to push through thicker materials. A two year warranty covers the unit, showing that HomeRight paint sprayer company is confident about the usefulness of this model. There are three spray tips included, with three more available as a separate purchase. The price is decent for the extra spray tips and won’t add on a lot of additional cost by purchasing them separately. 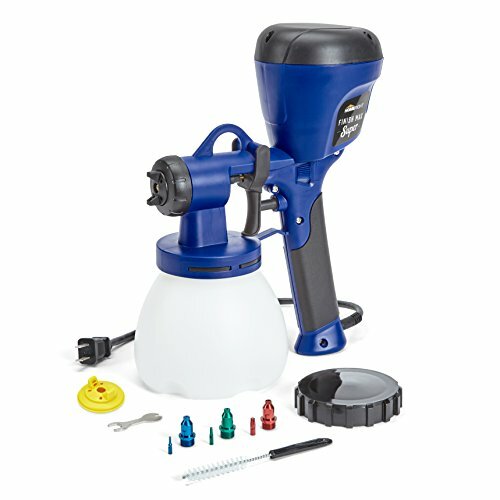 Larger projects can be handled by this paint sprayer since it comes with a 38 ounce container. All of this is packaged into one tight unit that still remains under 3 pounds, an amazing feat of its own. A handy tip selection chart lets you know the best way to approach materials with the correct equipment. It’s included with the package but is also available online. This is the most powerful low priced paint sprayer on the list and comes with high recommendations. Anyone can use this electric paint sprayer. Clear directions help out beginners that want to get the most out of their tips. With the low prices for extra accessories, this could be a huge bargain for intermediate users that want professional grade performance without the price. The Magnum Pro X17 is part of a long line of great paint sprayers. It’s high priced for a reason, with this model ranking high with professionals. With a rated capacity of 300 gallons per year, you can use this on multiple projects in a month without wearing the unit out. When in action, it pumps out .34 gallons per minute, a significant increase over the lowest model in the current series. You won’t find a lot of projects that are too big for the X17. Like all the products in the Magnum series, you can spray directly from a paint bucket that is 1 or five gallons. Support has been extended for hose length, and the x17 is compatible with lengths up to 150ft. Roof projects, buildings and other large scale paint jobs won’t be limited by the hose. Cleaning is handled with the PowerFlush adapter by attaching it to a garden hose for flushing. But what really separates the Magnum Pro x17 from other devices is the use of the ProXChange system. With it, you can replace a failed pump without any tools or experience. For the high price this is offered at, users get a lot of professional features that only a few brands have available. 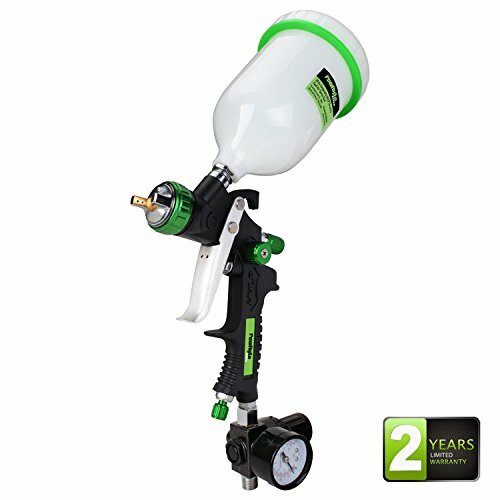 All user levels will enjoy using this powerful paint sprayer from the Magnum series. Professionals get a lot of use out of already, but beginners will only see a return on their investment if it is used for medium and large scale projects. The Graco X19 is the second only to the Pro210ES in the Magnum series. It is a high priced paint sprayer that improves on every design and mechanical decision from the previous models. Pressure can be adjusted so that you expend paint at the levels necessary. This keeps users from using too much or too little paint per project. Thick materials flow through the system without an issue, as the improved ProX stainless steel piston pump is strong enough to move unthinned paint. In terms of power, this is the most advanced on the list. Very few paint sprayers provide a better experience with multiple types of materials in larger projects where several coats are needed. There is some serious weight to the core of the paint sprayer, with a listed 38 pounds including the motor. Just like the x17 you can change out the motor without tools if it happens to fail (ProXChange). Maximum tip size has been bumped up to 0.019 while the motor has a performance rating of .38 gallons a minute. This is the best paint sprayer on the list in terms of specifications, design and compatibility. Intermediate and professional users should be all over this model. It has everything they need at a fair price and value. Beginners starting into painting sprayers won’t really benefit from this model even if they have a large area to paint. All of the wagner paint sprayers on the list can be used to coat cars and trucks, but the MotoCoat is the only one that is marketed for it. This specialized paint sprayer is unique in design and specs. The price is mid-range, but on the lower level compared to competitors. With the iSpray nozzle and cup attachments, users can spray thick coats with textured finishes or detailed finishes. By using the correct attachments you are guaranteed a smooth finish even when spraying thin materials. The unit is powered with a capable motor, so any outlet will do to get you started. X-Boost Turbine is the technology they are touting for this design, and for the cars and trucks it works really well. With the 39 foot flexible hose you get similar maneuverability to that of a hose when cleaning your car. Spray attachments come apart quickly so you can reattach the one you want. Two spray guns come in the package; one iSpray and one Detain Finish. Consumers that are serious about the way their car looks will enjoy the specific features of this paint sprayer. Anyone that wants a paint sprayer for car or truck work will find this a must have item. All levels of users can handle the sprayer, but outside of automobile tasks its value is limited. Since the price is in the midrange and it is a one trick pony, that may scare off a lot of beginners or intermediate users that don’t do a lot of detail work. Second to last on the list is the HomeRight Power Flo Pro. Although this mid-priced paint sprayer’s name is a mouthful, its actual execution is great. At 2800 PSI it is right up there with the higher end of the Magnum series, showing that its motor can stand up to the big boys. Clogs are handled by the reversible spray tip, one of the many innovations of the Power Flo Pro. Cleaning the unit can be done by filling it with water and a solvent. Then just spray like normal until everything is cleaned out, usually in one or two passes. If you tend to use your paint sprayers a lot, the two year warranty will take care of any concerns you have. The company does good work in the customer service area should anything happen to the motor or other major materials. One of the standouts with the equipment is the chrome plated spray gun with its installed mesh filter and guard. This is professional grade quality at a price that can’t be beat. This is a really good paint sprayer for all levels, particularly for beginners and intermediate users. There really is no project this product can’t handle, so if buyers consider Magnum to be out of their price range, the Power Flo Pro is the next best thing to buy. The Wagner Flexio is the last product on the list, falling at the lower end of the midrange pricing structure for paint sprayers. It is a largely unappreciated paint sprayer that has a lot to offer users that have medium and large projects. Surprisingly, at this low price it handles unthinned paint like a champ. Oil based paint, urethane and stans are the other materials that work well with this unit. Up to four adjustments can be made with the iSpray nozzle; horizontal, narrow, wide or vertical. That is one extra pattern included even when a lot of the high end models lack it. Changing out nozzles using the Lock n Go design is seamless, making jobs with varied material types less of a chore. Clean up duties are also enhanced since you can just drop the free nozzles in a cleaning bucket when done. The iSpray nozzle comes attached to a 1 ½ quart cup while the detail finish nozzle is attached to a 20 ounce cup. Air hose length is 11.5ft. , so is slightly below average for paint sprayers of the same size. Consider this a worthwhile option for its strong motor and great nozzle support. The tough carrying case that packages everything makes this a great setup for professional works on the go. But the ease of use turns this into a great buy for any level, even beginners. With the fair price, it reaches a lot of buying markets without compromising features. The best home paint sprayer will contain a lot of features that are beneficial to the interior and exterior of the home. With their massive gains, users will find the spraying process a much more efficient use of their time. The high priced Graco Magnum 262805 x7 is great for exterior painting thanks to the fully adjustable pressure. So no matter what the project size, you’ll have precise control when doing exterior painting as in the case of wagner paint sprayers which combine control and power for feasible coverage. Unthinned paint can be used, getting rid of one extra step needed to finish an exterior area. Other time saving features include a SwitchTip for clogs, and the ability to spray directly from a one or five-gallon bucket. It is the ultimate time saver for exterior painting jobs, and was built to remove a lot of extra preparation steps needed for small, medium and large projects. Users that dread doing the preparation work for exterior painting. When time is money, a home paint sprayer that doesn’t waste your time will always be worth the extra money. The price is a little more forgiving on this paint sprayer model for exterior painting. That doesn’t mean it is slacking in other areas, as the 3000 PSI piston pump is more than enough for hard outside jobs. Pressure control is handled by an easy to access knob, providing tight control when you need to change the amount of paint being sprayed. Rust and corrosion resistance comes standard with this model which is something that benefits exterior painting. With a good amount of protecting from the elements, you won’t have to worry about fast degradation of the parts. Users that have a lot of exterior painting to do but don’t want to spend an arm and a leg on the same time getting benefited as in professional paint sprayers. You’ll still get a lot of high end features, so it isn’t a huge compromise. Overall, this is a high-end paint sprayer at a bargain price. This may not be the best paint sprayer for home use, but for exterior work it is one of the best! The high price of this Graco product comes from its Hi-Boy cart airless designed paint sprayer. In its natural position, you can place paint on the ground direction underneath it so it sprays directly from the can. The feet underneath the unit helps to steady the can if you’re on an unsteady exterior surface. With a maximum hose length of 150 ft., this is also ideal for industrial exterior painting in large areas. It can also run off of a generator or normal home outlet. Buyers that are looking to do heavy duty exterior painting but don’t want to lug around a lot of extra weight. This is where this product excels at being a good paint sprayer for house exterior. You can save a lot of money by going with this mid-priced model from HomeRight. When you need to spray paint wood or other exterior items, this product handles it with ease. That includes medium and large projects, which fall right into the capabilities of this sprayer. When using a 515-reversible spray tip, users can remove all clogs as they happen. A full two-year warranty is included with the package. If you plan on using this solely as a tool for exterior painting, then that warranty will cover a lot of potential troubles if something goes wrong. Homeowners that want a professional paint sprayer at a low price. This does the job for exterior home painting at a fraction of the cost, while still maintaining a lot of the core features of traditional sprayers. 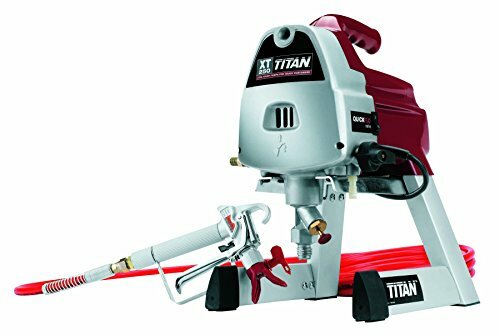 With the new High Efficiency Airless system, the ControlMax 1700 Pro crushes all exterior small and medium paint jobs with this model of Titan. Even overspray is handled well with this setup, decreasing it by up to 55% compared to competing airless sprayers. All of this comes at a high price, yet they kept it low enough for most customers while adding a beefy two-year warranty. Other notable features of this model is the Sureflo Pusher Valve, useful for consistent priming on tough exterior areas. All of this is possible under a motor that operates at 1500 psi, making this model one of the quietest in the exterior painting category. Homeowners and professionals with medium workloads. Despite the 1500 psi, this paint sprayer does really well in low and medium quality jobs. It also introduces painters to a lot of quality of life features like the HEA and Sureflo Pusher Valve. SmartControl™ 1.0 Pressure Control – delivers a consistent spray fan. The powerful pump of the Graco Ultra 395 turns it into a true powerhouse for exterior spray painting. It is the patented Endurance pump, capable of handling large volumes of paint without lowering the life expectancy of the product. This paint sprayer was built for the long hall, especially for industrial jobs. All of this looks good on paper, but the one thing consumers will focus on the most is the high price. As one of the most expensive paint sprayer products on the list, it is strictly aimed at power users that want to get a lot of exterior work done. Professionals and any user that wants to do heavy duty exterior painting. The power of this unit is more than you’ll need for even the heaviest projects. The first word that comes to mind when buyers look at the ControlMax 1700 Pro is overkill. Yet, interior jobs benefit greatly from its versatile features making it professional paint sprayer among several other brands. Built into this large unit is overspray protection, improved control and much better sprayer life. All of these things are positives when you’re looking or the best indoor paint sprayer. With a max operating pressure of 1500 PSI, it will cover any interior paint job while also being useful for small and medium exterior work. Like all products from the company, a lengthy two-year warranty is provided. Professionals and homeowners that want a lot of versatility with their paint sprayers. This product comes recommended for interior and exterior work. The extra bit of power it provides outside of the house is just an extra bonus. This Wagner model falls into the short list of best handheld paint sprayer for walls. It is a much more traditional interior paint sprayer, with familiar features that don’t take long to learn. There are three spray patterns with adjustable controls. You can use these when you want to cover large areas or get into tight areas. For interior paint spraying, the patterns really nail down the most useful options. With the included 20ft. hose you’ll have no issues moving around the home while leaving the main unit stationary. All of this is available at a low price, which comes at a fraction of the competition. This product can you help you in time saving during paint spraying and is convenient to use without needing massive amount of power, This Wagner can still be used outside, but has features that are more favorable to inside use. The Graco Magnum 262800 is another home paint sprayer that packs a lot of power. No matter the project size, you should be able to handle it without stressing the motor of this product. With the included flexible suction tube, it can directly spray from a one or five-gallon bucket. That is less mess for you to clean up while using an interior paint sprayer, and more time for taking care of the details. Additional support for a seventy-five ft. hose makes it a dual threat for exterior work. Anyone that wants a competitively priced paint sprayer that can handle heavy duty tasks. Despite the small size of the device, it is deceptively powerful as an indoor paint sprayer. With additional attachments, it can be a superior paint sprayer for house exterior. The last interior paint sprayer in this category is the HomeRight Finish Max. It is one of the best paint sprayer for walls, and also counts among lowest priced paint sprayers. At four hundred watts, it is a premiere indoor paint sprayer with all of the great features of a high end device. One handed operation gives you plenty options when leaning, crawling or bending over into hard to reach spaces. This is an entire kit that comes with a lot of extra pieces to get you started. This is the best paint sprayer for home use if you don’t need a lot of power. Beginners and intermediate users. But there is no doubt that it was built from the ground up for beginners and their personal interior needs. Setup instructions are brief, to the point and easy to follow. It is a full DIY kit that makes small and medium projects fun to complete. If the price doesn’t attract you to this paint sprayer, then its ease of use will. A fence stain sprayer needs to be lightweight enough that it can be held for hours at a time. This model accomplishes that, and weighs only a couple of pounds. The 27-ounce container is a decent size for painting the fence without having to swap out for more paint. And even when you need to swap, the container comes off without a problem. Buyers that want a simple fence paint sprayer that can also double as an interior paint sprayer. The HomeRight paint sprayer is a handy little device that doesn’t have a lot of weaknesses, so should do well in multiple tasks with the right equipment. When you want to get the job done right the first time, this Fuji Spray product is the way to go. It is the most powerful fence stain sprayer on the list, and has the highest compatibility with materials. With all of the features crossing over into professional grade quality paint sprayers, beginner and intermediate users will have at their disposal a lot of ways to spray paint wood and other materials. The product is on the heavy side, but does come with a carrying handle so you can take it wherever you go. Professionals and experienced home users. A lot of users won’t need a fence paint sprayer this powerful, especially for home jobs. But if you are wondering how to do with exterior paint spraying job, then this could be a great all in one paint sprayer. With the excellent price of this model among different models of wagner paint sprayers, you’ll be able to save a lot of money and time. It is a good fence stain sprayer with respectable power. That power comes into play when you’re trying to get an even coating on the fence. The speed and consistency is rare in a sprayer this low priced, and it really helps that the device comes with a low overspray tolerance. Total control is ma++intained at the highest settings but the tradeoff is a low PSI of 4 at 40 cfm. Beginners and intermediate users that want a decent value when buying a fence paint sprayer. It has enough power behind it to also be useful in light exterior and interior paint spraying tasks. But beyond the basics with painting, users may find they need a more equipped paint sprayer. To spray paint wood effectively, you need a time saving paint sprayer during tedious job that has good power and a lot of control. The latter is the most important, so with the low price of this model, users will get a good deal. For light and medium tasks, painting wood with this device is easy. It has a lot of speed with built in over-spray protection. First time users can begin painting wood after a setup of only a few minutes. Multiple materials like enamels and sealers are compatible, so you can really get a lot of work done involving wood. Anyone that needs a good wood sprayer and doesn’t want to spend a lot of money. Professionals will prefer something more robust in features, but the average user will get by fine with this model. Consumers should make themselves aware of the limitations of this model, as it wasn’t meant for large projects. Consumers that want professional grade equipment to spray paint wood will get a lot out of this package. The Fuji 2202 Semi-Pro 2 HVP comes with a 1 qt. cup and metal turbine case, both heavy duty. Overspray is reduced in the 25ft. hose with the use of an air control valve. It takes a little messing with to get right, so a skilled user is needed for the product to reach its full potential. This product among other high price tag paint sprayers reflects the superior usage and features of its ability to spray paint wood. Professionals and intermediate users that require a lot of power and precise painting. You’ll have no trouble with wood objects, and with everything in the package it works great for interior and exterior painting. This is a powerful all in one package that should work as the only paint sprayer you need. Count this as another product that can spray paint wood with some decent consistency. It is small, powerful and best of all portable in the family of reliable HomeRight paint sprayers to buy. Adjustable nozzles and three spray patterns gives you plenty of use when finishing different types of wood. The company included a lot of useful accessories to extend the product’s abilities outside of small time paint jobs. So in a way, this functions well in both small and medium sized projects. There is heavy support for multiple materials, with many of them remaining incompatible with competing paint sprayers. For such a low price, this is a great deal if you need to paint wood. Just about anyone can enjoy the benefits of this paint sprayer, even professionals. There is enough power (or at least enough accessories) to make it useful for painting any type of wood. You can get a lot of work done in a minimal amount of time with this setup. For daily use, there are few models that beat the HV5500. If you have to paint wood in multiple places inside or outside, then this paint sprayer is perfect. Everything packs in nicely into the holding station with a long handle for transport. Besides the great ergonomics, this model comes packed with a powerful 650w motor. It can handle every spray paint wood task you put in front of it. Heavy duty users will also appreciate the 2.0mm stainless steel tip and needle, a combination that puts full control in the hands of the user. Upon knowing basic paint spraying tips and techniques everyone can benefit from this spray station. Wood can be tricky to paint, yet this package has everything you need. There is professional grade quality that shows, especially with the tip and needle. And with such a powerful motor backing it up, jobs will take less time to complete. When you want to spray paint wood in the most efficient way possible, the Wagner 0518080 comes to the rescue. Features that enhance its wood painting include variable pressure control, a two stage turbine and the ability to handle multiple materials that help you save the time in paint spraying needs. There are three spray patterns to play with, but the versatility of the unit remains its biggest strength. The cup used to hold the paint is 1 ½ quarts, so there is plenty of room to get a sizable job done without too many refills. Inside the package is also a 20 ft. hose, so you’ll have plenty of freedom to move. Beginners and intermediate users will get the most use out of this product whether they use it as an indoor paint sprayer or an exterior paint sprayer. For wood materials, it does an excellent job, and can even handle a few large projects. Rated as the best indoor paint sprayer by several customers, this Graco model is still impressive. It comes in the list of professional grade airless paint sprayers in the body of a consumer product. All of the advanced features like adjustable pressure, build quality and the RAC IV SwitchTip makes this a great product. There are few models that work this well as an interior paint sprayer, but you can count this as one of the best. The Magnum 262800 X5 is an outstanding choice for indoor or outdoor painting. Just about anyone will finds using the X5 an absolute joy. Professionals with big projects will be familiar with the features. Beginners and intermediates will have to endure a slight learning curve, but nothing out of the ordinary. If you’ve used a home paint sprayer before, the X5 will have about the same learning curve. A home paint sprayer that also works as a reliable indoor paint sprayer. The 400 watts gets the job done on small and medium painting tasks. Smoother finishes are possible, giving users a much better look than a traditional roller or brush. All of this is possible without the aid of a compressor, although there are some performance issues when dealing with some medium sized projects however, a comprehensive guide on HomeRight paint sprayers should serve the purpose based on your needs. The usual two-year warranty is included with the purchase. As a midrange indoor paint sprayer, this is a really good deal for beginners and intermediate users. Buyers that want a low priced paint sprayer but not the best indoor paint sprayer. This does the job just fine, even with its limitations. There are plenty of projects that can be handled by this sprayer without it missing a beat. With the 24-ounce container, consumers will spend less time refilling and more time painting. Buyers familiar with the Wagner Spraytech brand know all about the quality it provides at a low price. It’s highly regarded as the best indoor spray painter for beginners. But its usefulness also extends to intermediate and professional users that don’t want to take out their bigger sprayers for indoor jobs. The star feature of this device is the variable air pressure control. With it, you are less likely to make mistakes when precision is needed. Less ‘bumps’ or surprises while painting makes for a much better experience with indoor painting. Two cups are provided, one professional grade another 1 ½ quart plastic cup. Beginners and intermediate users who know how to use a paint sprayer may surely benefit from this product. Professionals will find it a breath of fresh air if they want a competent indoor paint sprayer without having to lug around something twice its size. In the right hands, this paint sprayer can handle the bulk of jobs, be it large or small. 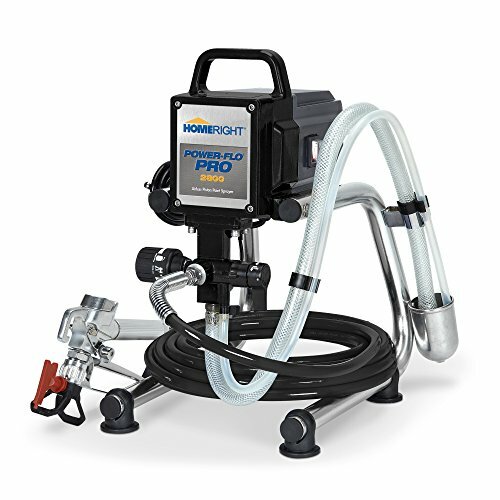 Buyers that are looking for the best indoor paint sprayer can get their money’s worth with the HomeRight Power Flo Pro. With a massive 2800 PSI, there is no job this indoor paint sprayer can’t handle. Users can save a lot of time by using the included hose to spray directly from a one or five-gallon paint can. For indoor use where space is a concern, that is a big feature that shouldn’t go unnoticed. A standard two-year warranty is included to cover major parts and services. Power users that handle a lot of indoor painting projects. For smaller jobs this is overkill, but obviously it can handle them just fine. This may be just out of the technical expertise for beginners, or at the very least they will need to learn a lot of advanced features. Without the advanced features, you’re missing out on half of the reason to own this paint sprayer. Sometimes simple is the best solution, and that is exactly what this model goes for. It is a mechanically sound product that may not be the best paint sprayer for furniture, but is one that gets the job done without any bells and whistles. With the use of the included mason jar, you can spray paint any piece of furniture in the home and office. The best thing about this setup is the ability to fill any mason jar with paint and store it for later use. Even with its limitations, this is a great deal. Beginners and intermediate users that already have an air compressor (and experience). Here is how you may get to know whether a paint sprayer needs an air compressor also helping you find the best fit air compressor. Professionals or power users won’t find this purchase appealing, but this doesn’t take into consideration the many other uses for it. Outside of being a useful paint sprayer for furniture, this setup has been known to be used for art projects. Once again the Wagner 0518080 comes through for consumers that want an all in one solution. 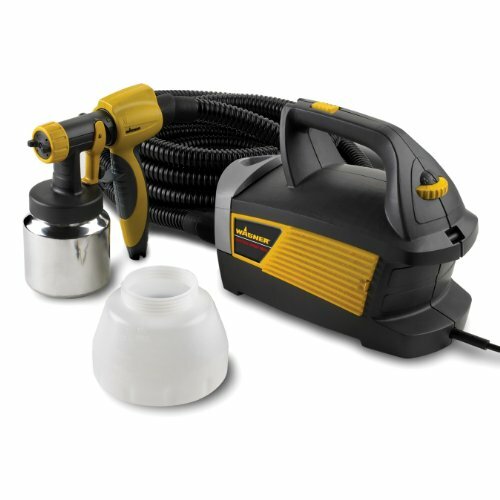 Not only is it the best paint sprayer for furniture, but it is also an incredible deal for a paint sprayer period. There are barely any shortcomings to purchasing this as your primary interior painter. It has a lot of reach, a low learning curve and also respectable power when being used for medium tasks. Everything is powered by the two stage turbine, with the ability to handle multiple types of materials other than standard paint. Users of all levels will appreciate the great control and power of this product among highly demanded HVLP paint sprayers of other brands. Even professionals can get a lot of use out of it if they want to renew some old inventory. The best part about this setup is that you can get the most out of this purchase without touching any of the advanced features. A furniture paint sprayer that doesn’t get enough credit is this Graco model. It is a little on the price side, but has a great compact size and plenty of power to spare. This is the higher end model in its category, so if there is an expensive piece of furniture that you only want the best for, then this is the purchase to make based on the other models available in Garco paint sprayers. It also functions great as an interior paint sprayer or when you just want to spray paint wood. Users that want the most power they can get packed into the smallest spray painter. For furniture work, the benefit of this setup is more control over how you spray. There are loads of accessories to buy and use that extends the usefulness of this spray painter outside of furniture projects. But with all that said, this is still a product aimed at professionals and power users. Spray painting fabric requires a steady hand and a product with high precision. That is why this high priced Graco Cordless model is so good. With tons of professional features built into it, the reason this particular model comes so highly regarded is convenience. It’s both cordless and airless, but still strong enough to use as an all-purpose indoor paint sprayer as well as for exterior walls if you know how to do wall painting using spray. When it comes to furniture, it’s difficult to recommend models that are more accurate than this one when spraying. For small and medium jobs, buyers will get their money’s worth out of this product. Users that want the highest accuracy when painting furniture. High end, rare or even collectible furniture will fare a lot better with the use of this Graco cordless. The batteries last a long time before going out, and the package comes with two. So you’ll never be out of juice during a time sensitive project. Not all low priced interior spray painters can fill the role of being good for furniture painting. The Tacklife SGP15AC is the rare exception, and performs well above expectations. Spray painting fabric by using its three nozzles and spray patterns is a great joy filled with accuracy, power and a lot of canister space. It holds up to 900 ml, which is more than enough for a lot of medium and heavy furniture projects. To make it easier to get started, a funnel is included with the package. Beginners, intermediates and even some professionals will find the SGP15AC useful for any furniture painting project. With its usefulness in other areas, this could turn into a permanent home paint sprayer. When using it with furniture, buyers will be pretty satisfied with their purchase. The manual contains good information about deeper features. The last product to be considered for best paint sprayer for furniture is the Wagner 0529033, a low priced model with a nice build perfectly personalized paint sprayer under $100 creating smooth finish. What makes this so special (and different) from the rest of the competition is its ability to handle decorative paints. Although thinning is necessary, in the right hands you can create some really beautiful patterns on furniture. It isn’t the best paint sprayer for furniture, but from a creation standpoint, this is the best choice if you have a specific vision. Regular features like material flow control and pattern adjustment compliment the entire package. This is 100% for creators of any level, even professionals. Artists with some carpentry skills can really change the look of any plain looking piece of furniture with this device. They can also improve the look of faded designs on furniture that is getting old. But outside of superior design options, you would be better served to get a different paint sprayer. For superior wall to wall painting, the X7 is the choice of many. It is one of the best paint sprayer for walls, and has consistently been a top performer for years. Both the external and internal components are professionally made for max durability. In particular, the steel piston pump puts out consistent pressure so that unthinned paint stays even on the walls. This is 100% a high use paint sprayer for inside and outside the home, and it is rated for up to 125 gallons a year. Intermediate users and professionals that want the very best coverage on their walls. This is the big boy of the group, so is considered more than what’s needed for wall painting if you’re a beginner and you may check our tips on how to spray paint on exterior walls. The X7 is also an excellent exterior paint sprayer, so it is considered a great all around product to purchase. If you take one look at the Wagner 0518080 HVLP, you’d think it was a professional grade paint sprayer for walls. In fact, just a quick glance at the features makes it look like the best paint sprayer for walls. This Wagner model isn’t professional grade, and it also isn’t the best paint sprayer for walls. But this product is an incredible value for buyers that want a consistent and decent less expensive paint spray. The variable air pressure control is just right, ensuring that walls are covered evenly no matter the volume you spray at. The metal cup and 1 ½ quart plastic cup for paint are the perfect amounts for small and medium projects. Beginners and intermediate users that don’t want to spend a lot of money on a high end paint sprayer for the wall. They still get the most used features (spray patterns, multiple containers, multiple material handling) without paying a high end price. As a top rated choice by multiple sources, theXt250 is widely praised as being the best paint sprayer for walls. While this may be subjective, there is no denying that it is packed with top of the line features. This is the air sprayer that professionals feel comfortable finishing a project with. It is reliable, strong, and best of all it gives the user the best control when painting interior and exterior walls. The ½ power motor is strong, but not too strong to the point where it is a hog. Intermediate, power users and professionals that want to get the job done right the first time. The Titan Xt250 doesn’t waste resources, so the airless spray hose wastes very little paint no matter how you use it. Moreover, a comprehensive guide on Titan tool paint sprayer could also be helpful. The handle for carrying the unit around is comfortable, and should be light enough for most users to handle on their own. The last paint sprayer for walls is the Finish Max C800766, a good hendheld paint sprayer that works well on walls. It won’t be confused with being the best paint sprayer for interior walls, yet it gets the job done. Rock solid stability is one of the benefits of this model, as you’ll have less clogs when using thicker materials. The strong 400 watts was built to spray thicker paints, and the professional grade nozzles do a good job of not jamming up. Buyers should consider this a great choice for painting their walls when they don’t need a high end device. Users that fall into the beginner and intermediate category will get the most use out of this product. The 27-ounce container is the perfect size for an indoor paint sprayer, and the light weight of this model makes long painting sessions easy. Graco’s Magnum series is the big standout, making the list multiple times. It is a popular series that keeps doing everything right, improving with each iteration. Wagner and HomeRight are not far behind, with just as many consistent models as Graco. These three companies make up the bulk of the list so are considered among the most trusted brands you can buy from. Warranties and customer service from all three companies is top notch, adding to their brand appeal for new or returning buyers. Although these three brands dominate, the smaller companies have very recognizable products. It’s good competition with the brands that keeps their products innovative. The list is full of low and midrange prices for the paint sprayers. The high prices are reserved for the professional grade products like Magnum. You’ll notice a bump in available features and pros when looking at high priced paint sprayers. That doesn’t mean they are only for professionals, as plenty of users buy the expensive paint sprayers and use them just fine. But there is a learning curve when spending that much money for the extras. There are a lot of convenience features for the price that goes in with the bulk of the modernized mechanics and accessories. Features vary by brand, with the deciding factor coming down to price. The higher the price, the more options you can expect from the paint sprayer. Durability is also tied to price, with the more powerful motors going to units in the midrange and high price bracket. All In One Units – This covers paint sprayers that don’t rely on an air compressor to work. That makes up more than 50% of the list, so that should give you an idea of how popular these models are. All in one units only require an available power outlet to function correctly. Nozzles – The more nozzles it supports, the more paint options you’ll have. Nozzles can do everything, even add texture to paint. For detailing work, having a good nozzle guarantees the job finishes evenly. Try to purchase paint sprayers that come with a lot of nozzles included. Multiple Patterns – An ideal sprayer will handle horizontal, vertical and circular spray patterns. Some even support wide patterns so you have a total of four. Just like nozzles, more is better if you want the greatest experience. Variable Control Trigger – With a variable trigger users can gain much better control over the amount of paint they want to spray in an area. Having a hair trigger also helps, which means you don’t have to squeeze it to the point where your finger hurts. Strong Motor – There are a lot of technologies with the motors, so pay close attention when looking at the PSI and overall horsepower of a product. Stronger motors can force thick paint through without struggling. Weaker motors don’t work well with thick paints and tend to give you problems when running for hours at a time. Mason Jars – Paint sprayers that use mason jars overcome the limitations of other sprayers that use canisters/cups. Mason jars are larger, easy to acquire and do a better job of storing multiple different types of paint. You could line up a shelf of different paint types and oil on a counter in mason jars to pick and choose the one for a current job. High Coverage – You want high coverage per minute so that projects don’t take forever to finish. A good CPM is around 3.5 ounces and higher. Overspray Technology – This feature is implemented in different ways based on the brand chosen. Think of it as ‘auto-correct’ but for painting. Not only does it help with balancing spray amount, but more control is given to the user when making precise moves. PowerFlush – This technology belongs to the Magnum series, although it is used to a lesser degree in other brands. PowerFlush still remains the best iteration of the technology, letting you attach a garden hose to the unit so that it cleans itself automatically. The process is fast, efficient and great for maintenance after a project. Reverse A Clean Spray Tip – This isn’t exclusive to the Magnum series, but like the PowerFlush it is the best version. Whenever you get a clog while paint spraying, move the switch and the clog is magically gone. This is something you won’t need to use often if the motor is strong enough to handle unthinned paint. Long Hose Length – Long hose length gets users away from the unit itself so that they can handle jobs on different floors or even the roof. Painting a bus requires a long hose, unless you want to keep carrying the main unit around. A long hose makes up for a short power cord, which is something customers should remember when making their final decision. Paint sprayers listed have different compatibilities, with some showing strong support for hose lengths up to 150 ft. long. Anti-Spill – This applies to hand sprayers only, where spilled paint on your hand can be a real nuisance. Anti-spill technology takes the form of a strong lock or high grade suction to keep the paint in place while you spray at angles. Think of it more as a safety issue than one of convenience. Detailed Instructions – It seems trivial, but instructions are still an important part of the product. Users that have never handle an air compressor before are in danger of destroying the paint sprayer if the usage instructions are unclear. Flexible Suction Tube – Instead of rationing paint into a small canister, put the tube from the paint sprayer directly into your paint. This is a great time saving feature that works well with 1 and 5 gallon tank buckets. Some models even let you lock the bucket to the machine for easy carrying. There are two times where size is a concern; when hand sprayers are heavy enough that you suffer hand fatigue, and when ground units have wheels but have to be lifted into an automobile. Avoiding the first one is easy, but the second one is a necessary evil. Paint Sprayers with carts are big because of their strong motors. Wheeling them around rough surfaces and up a flight of stairs is no problem because of the wheels. Lifting them up and putting them in a car, truck or other vehicle is another story. Buyers should consider whether the size of a paint sprayer will be an issue when traveling. Clear instructions and features points users to the right direction with handheld sprayers. Some handheld sprayers have their own motors while others require the use of an air compressor. Without an air compressor, the sprayer is basically a hose with a container attached. And you can’t just use any air compressor, which is exactly why requirements are listed. It has to have the right threat fit and also meeting minimum power requirements. In a case where instructions are unclear, contact the company so you can figure out if your air compressor works with the product. Handheld paint sprayers give you the benefit of a lower cost product that handles small and medium rooms. Larger units are great for all areas, but specifically excel at medium and large projects. Project size is going to determine if handheld or large paint sprayers will get the job done. You may also want to take a look at larger units if your usage is high. It would make sense to get a large paint sprayer over a handheld unit if you plan on using it for varied tasks. The extra horsepower in the larger product will give you an edge since it handles thicker materials better. Are Specialized Sprayers Any Good? Yes, with the specialized Wagner MotoCoat a top choice for automobile paint spraying. The difference in quality is astounding, but the con in this instance is lack of support outside of its specialization. Getting a paint sprayer that specializes in interior work won’t help you much when exterior painting is needed. There is nothing wrong with getting a specialized paint sprayer if you can live with its limitations. Work around it by buying a low cost paint sprayer that compliments the weaknesses of your specialized product. That way you get the best of both worlds without any compromises in quality. There is plenty of information available to help you make an informed decision about which paint sprayer is the best for your home or business. The pros and cons listed should come in handy when you need to separate the good from the great paint sprayers.